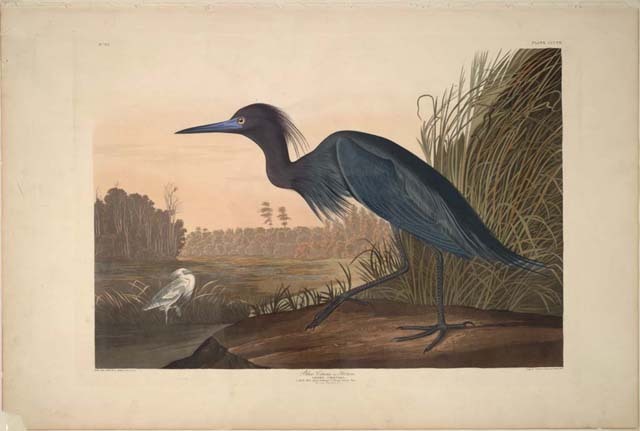 Today marks John James Audubon’s 226 birthday. Though he wasn’t the first to document and detail the various birds of America, he is certainly most famous. The woodsman artist introduced us to birds as specimens to appreciate, rather than eat or fear, and his work dominated the wildlife genre. The seminal Birds of America collection set the standard for representations of birds and wildlife for many years to come. Sold as a subscription, buyers parted with $1000 -a princely sum- for what would later number 435 prints, issued five times a year, between 1827 and 1838. Today, the style persists through the works of Roger Tory Peterson and David Sibley – not to mention the more unusual stylings of Walton Ford. But it was actually not the first to take on the project, and it’s worth remembering another contributor who occupied his Birds of America with the pursuit of what was American. Alexander Wilson, a Scottish immigrant, had taken it upon himself to enumerate the various birds of America in an ambitious series, the expression of which may ultimately have killed him. 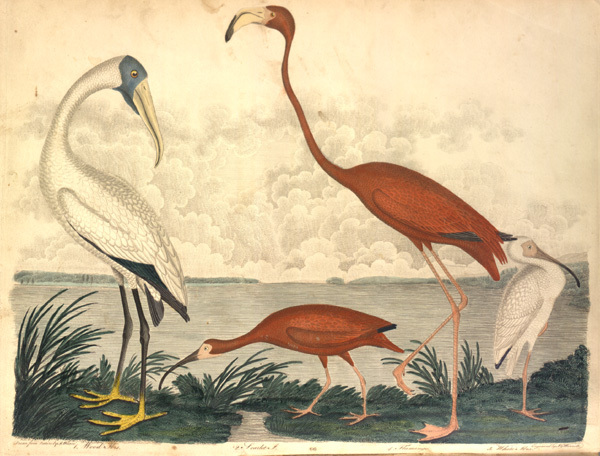 From 1802 to his death in 1813, Wilson pressed on in his catalog, description and rendering of the birds of America, with the final volume being published in 1814 by his friend George Ord. Frustrated with the lack of early acceptance for his project, he worked in obscurity for many years, resolved to bring his ornithological campaign to a visible conclusion: “I shall at least leave a small beacon to point out where I perished.” Working as an editor on Ree’s Cyclopedia, he was finally able to get support in 1807 from its publisher, Samuel Bradford, and he began the task of surveying birds in earnest. Though Wilson would soon be overshadowed by Audubon, his names would last. Wilson’s depictions perhaps lacked the vitality and scale of his successor, but he imprinted an American perspective on naming and separating the birds of America from similar species from Europe. Some of them include Wilson’s Plover or Storm-Petrel or Phalarope. He took issue with perceived failings of Linneus: “Linneus and other have confounded this Vultur with the Turkey Buzzard but they are two very distinct species,” and wrote, “The more I read and reflect on the subject, the more dissatisfied I am with the specific names which have been used by almost every writer.” Separating a European species from its seemingly American counterpart, he complained of one example in 1807 to Bartram, “Europea has been applied by Pennant to our large sitta or nuthatch, which is certainly a different species from the European, the latter being destitute of the black head, neck, and shoulders of ours,” and he concluded, “whether I shall hazard a new nomenclature, or, by copying, sanction what I do not approve of.” Wilson seemed intent on finding and devising the uniqueness of this new country – specifically through its birds. The desire to invoke and define what was uniquely American was a feature of the time. It was a new country. The nation wasn’t more than 25 years past the Declaration of Independence when Wilson had begun his project, only fifteen years after the drafting of the Constitution and the public release of Jefferson’s Notes on the State of Virginia. Jefferson’s Notes were a response to France’s inquiry to the first states of the American experiment. Sent as a questionnaire to the governors of each state, Jefferson would use these to, in some sense, create a vision as much as a description of Virginia. George Ord, aside from being Wilson’s collaborator and biographer, would assist in a similar pursuit. 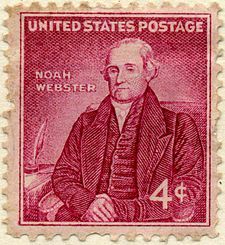 He the worked closely with Noah Webster on the publication in 1806 of his Dictionary: A Compendious Dictionary of the English Language. Of the Dictionary, Webster wrote: “The undertaking is Herculean; but it is of far less consequence to me than to my country.” The Dictionary, the words it collected and defined, and the project itself would give structure to the new country’s language and separate and elevate American English from English English. After all, Johnson’s Dictionary had not been updated for many years. If, as it is said, “a dictionary extracts and condenses the essence of all other books; it holds, as in embryo, the elements of all things known,” Webster’s Dictionary would provide a more perfect vessel for all things known. Wilson was hopeful for his adopted country and set on describing its rambunctious ascent, never realizing that it would include his own eclipse. In 1810 he purchased a rowboat in Pittsburgh and christened it the Ornithologist, among “the numerous arks and covered keel-boats preparing to descent the Ohio, its hills, its great rivers–the pillars of smoke rising from its furnaces and glass-works.” Floating down the Ohio, digressing to the Mastodon bones of Big Bone Lick, where he shot ducks and thirteen unlucky Carolina Paroquets, the emerald-green parrots of North America. Arriving in Louisville, he made his way to Audubon’s store and began his pitch for the Birds of America to the man who would later become synonymous with that title. Drawing from his satchel a well-tended example, Wilson laid it out on the counter for Audubon and his partner, Rozier, and he made a pitch for a subscription. Just as Audubon was preparing to sign, Rozier intervened and said, in French, “My dear Audubon, what induces you to subscribe to this work? Your drawings are certainly far better, and again you must know as much of the habits of American birds as this gentleman. Though Audubon would exceed him in his depiction of the birds of America, Wilson imprinted them with names that made them uniquely American.